Gamosa is a unique identity of the Assamese Society. 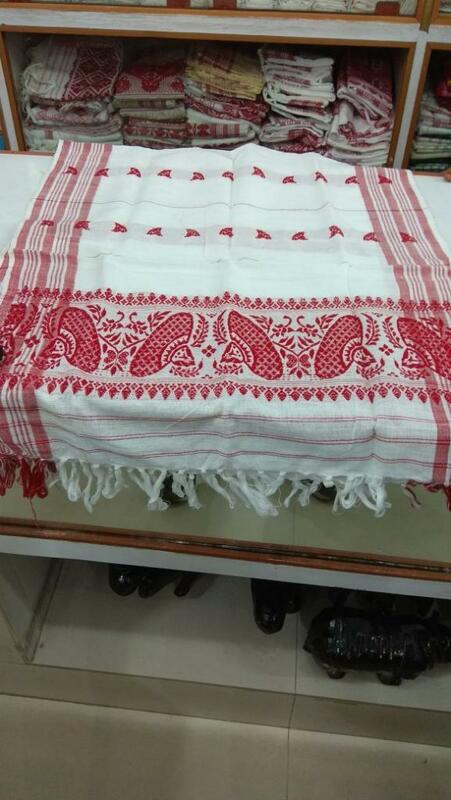 This small piece of cloth has high esteem and a wide usage in the Assamese culture. Gamosa is one unique cloth article in it's usage and looks. Nowhere in the rest of India something like 'Gamosa' is found. Gamosa is also known as 'Bihuwaan', as it is an essential part of Bihu festival of Assam. Gamosa is of rectangular shape, around 2 feet in width and 4 feet in height, closer to the shape of a towel. It's white in colour with red borders. One or two borders on the width, are woven with very artistic embroidery. There are Mini Jaapi's(traditional conical hat) embroidered over the Gamosa. The raw material used for weaving Gamosa is cotton. But some gamosa used in special occassions are made of Silk too. Though it's pretty simple, weavers show their artistic talents in the motifs of a gamosa. The Gamosa is primarily used to wipe the body after a bath (an act of cleansing), however, the usage extends to more than that. A Gamosa is used to cover the scriptures or the cowl in the Prayer hall(Naamghar). An object of reverence is always placed on a Gamosa and not on bare ground.. The Gamosa is used by Bihu dancers where they wrap it around their heads in a single knot. Farmers use it as a waistcloth (tongali) or a loincloth (suriya). People hang the Gamosa around their neck while praying in the prayer hall (Naamghar). While welcoming guests, they are offered a gamosa(referred to as bihuwaan in this case) and tamul (betel nut).